From left to right: Francois Hollande, President of France, Angela Merkel, German Federal Chancellor, Alexis Tsipras, Greek Prime Minister. 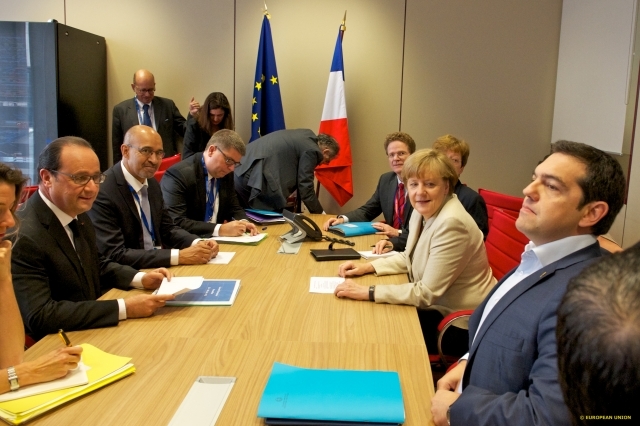 EU Heads of State or Government meet on 26 June 2015 to discuss jobs, growth and competitiveness, and the security challenges facing the Union. In the sidelines of the summit Francois Hollande and Angela Merkel held a long meeting with the Greek PM Tsipras, who seems obviously stressed with what he hears from the EU’s ‘directory’. (EC Audiovisual Services, 26/6/2015). Alexis Tsipras, the Greek Prime Minister, his government and their depressed country are now in real dire straits. This is a much worse position than in any time during the last five years, a period in which Greece repeatedly faced total collapse and was rescued by a troika of creditors (the European Union, the European Central Bank and the International Monetary Fund). Alas, today the economic, political and social Armageddon is there. Tsipras himself is challenged by members of government and some heavyweights of his SYRIZA left-wing party. They press him to accept any offer the country’s creditors may make, and even ask him to withdraw his decision to hold a referendum on Sunday. After three days, voters are expected to accept or reject the latest offer the creditors made, with Tsipras urging for a resounding ‘no’ result. It turns out though that the creditors have withdrawn their last offer and the Greeks are about to vote on a non-existing proposal. As for the country itself, it’s financially suffocated, with the banks closed for at least one week until Monday 6 July and its citizens queuing day and night in front of the ATMs to withdraw €60 a day. And this is possible only if the machine is loaded with cash. It became apparent then that Tsipras cannot even deliver part of the pensions and the public sector salaries he had promised to protect from the ‘bad’ guys in Brussels and Berlin. Let’s take one thing at a time. Last Tuesday Greece defaulted on an IMF payment. On the same day the Standard & Poor’s rating agency downgraded the credit ratings of the all four Greek systemic banks to selective default. This is one step before a full default. On the same day at midnight, the support program of the three creditors, which financed Greece after May 2010, expired. During the past few months due to a flight of capital the country’s banking system was kept alive by the Emergency Liquidity Assistance (ELA) transfers from ECB. Last Saturday the ECB decided to freeze those transfers provoking the shutdown of all Greek banks and the introduction of capital controls. Currently the internal market functions if at all only with cash. By the same token the country’s international trade has come to a standstill. There is no indication if the banks will be able to open on Tuesday 7 July, when the six days of the enforced bank holiday ends. The problem is that the ECB won’t resume the ELA transfers for as long as Greece is not under a troika program. As a result, the banks cannot reopen without the backing of ECB. In short, the country is in a state of limbo without any light at the end of the tunnel. The possibility of the introduction of a new national currency is so dreadful and administratively complex that cannot offer a tangible way out, at least not in the short-term. Let’s turn to the political agenda. Unquestionably, the government and personally PM Tsipras are out of tricks. In his appearance in a public TV interview last Monday he asked for a resound ‘no’ result in Sunday’s referendum. He said a strong ‘no’ result of 60-70% would have enabled him to negotiate with the creditors from a better position. Only three days later his policy is disputed even by the vice- President of government, Giannis Dragasakis. Tsipras’s strategy is now buried under the ruins of the banking system. He is offering everyday new concessions to creditors but one after the other all those proposals are being denied by the Eurogroup, the council of the Eurozone minister of Finance. According to a Wednesday report of the prestigious Financial Times newspaper, Tsipras is now ready to accept almost all the terms and conditions the creditors demand in order to restart financing the country. Still it seems rather impossible that the creditors accept even the slightest alternation of their last week’s offer. Actually Jeroen Dijsselbloem, the President of Eurogroup, has observed that last week’s proposal of the creditors is now not enough and Greece has to accept more austerity and reform measures. On the same line of thinking, the German Chancellor Angela Merkel said that the creditors will now wait and see what the outcome of Sunday’s referendum will be and then reshape their offer to Greece. As things stand now the troika of creditors, effectively guided by Berlin and the IMF, seems to have decided to let the country rot for some more weeks after the Sunday 5 July referendum, with the banks closed or even bankrupt and the economy completely dried of liquidity. In such an environment, the Tsipras government may finally capitulate and probably call for an early general election, only months after his January 25 win. This prospect will entail for the Greeks a very long and hot summer in every respect, economic, political and social. Greek society is already deeply divided between those who want to stay in Eurozone and those who prefer the introduction of a national currency, probably the new drachma. In conclusion the five month-long bold Tsipras strategy in the negotiations with the country’s creditors has been proved disastrous for the country and personally for him.